How To Start Your Own Successful Webshop? Some people have always dreamed about becoming an entrepreneur. When they were eight, they played supermarket with their family, on the age of thirteen they sold hundreds of lemonade cups on a warm day and when they were eighteen they had their own little sneaker business. But after a while, this income isn’t enough anymore. They want to buy a car and a house and with a small local sneaker business they can’t afford such things. At this age, some of these entrepreneurs decide to stop doing what they doing, simply because they don’t have the resources to continue. But that’s a shame! Try starting a webshop! With low costs and a big reach it’s the perfect way to continue your business! 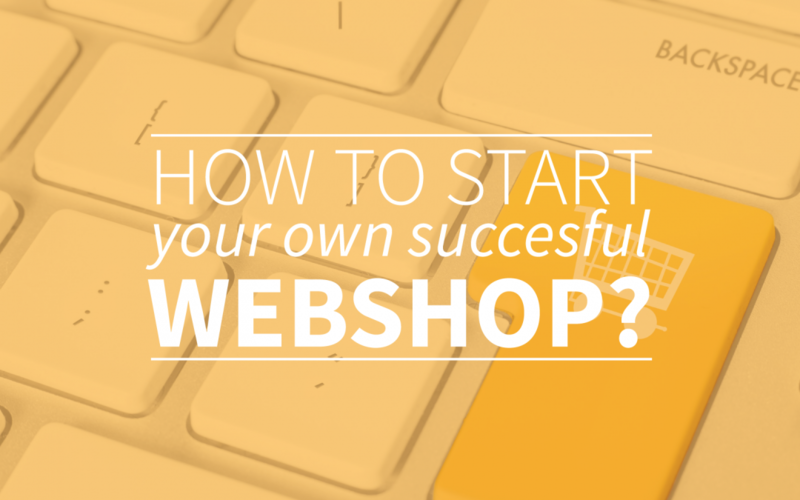 But how do you start your own successful webshop? First you need to know that starting a successful webshop isn’t just a one time thing. You can’t just start a webshop and wait for the results without putting any efforts in it. Well, of course you could do that, but probably the positive results will stay away. The costs might be lower, but the effort is just as high as when you start a regular shop. So don’t underestimate it! If you want to start a webshop, you have to know what your rights and duties are. Almost everyone can start a webshop, although there are some exceptions. You can’t just start a butchery, shooting or a demolition company because these businesses have some legal implications. But most of the time, you can just start right away! If you start small, by selling something through eBay or Alibaba.com you can just start selling without too much consequences. But when you’re starting to grow or even start your own website to sell your products, you should watch out a bit more. Make sure that your professional hobby doesn’t become a sneaky business that dodges taxes. If you make only a few hundred or maximum thousand euro a year and your customers don’t feel like they visit a company, you could still explain your business as a hobby. But when you feel like a business, you should act as a business, otherwise you could get in serious trouble. That’s why it’s important to know your rights and duties. These are different in every country and it’s definitely worth your while to enlighten your knowledge about this topic. If you’re not sure what to do and your business is growing to professional heights, consider contacting an administration office for some advise. As in every single business, it’s important to decide which way you want to go. You could choose to sell a lot of different things, like customized shoes and gardening tools in the same webshop but you’ll probably be more effective is you make choices. Make sure you have a clear mind of what you want with your webshop and build around these principles. Maybe you can find a good way to combine customized shoes and gardening tools, but at least make sure that you can explain why you made this choice. Lot’s of webshops fail to be successful because they don’t know exactly what they want to sell and who they want to motivate to buy their stuff. Although the webshop has a low entry level, it’s very important that you start being representative from the very first beginning. Also in the internet you deal with people and people remember everything. Also in the offline business world, people are very influenced by their own experiences and experiences of friends and family. On the internet this influence is even bigger. People share everything they think nowadays on social media like Twitter and Facebook. So your delivery was late? Well, lets put it on Facebook and see what your friends think about that. Make sure you watch out for these complains and feedback, because if you don’t respond the way they want, or even not at all, it can have a lot of consequences. From the very first beginning you have to be representative and respectful in every possible way, because one wrong decision or response in the beginning can ruin your entire shop! Tip 4: Promotion is the way to go! Even if your products are great and your webshop is perfectly finished, it’s possible that you still don’t sell much. Don’t panic, your products won’t sell themselves! You have to make sure that your target audience sees your products and wants your products! They NEED your products and you have to make that clear to them. How? By promoting them in all the different ways you can! There are many more ways to promote your webshop but our personal favorite is definitely ‘talk about it!’. You’re the person that wants to sell your stuff you are the best person to explain why they should buy it! So use every opportunity because talking positive is still the best promotion! With these 4 tips, you’ll be able to make a quick start with your websho. And with a little bit of luck and the help of your own free webtexttool trial account, you’ll be very successful in no-time!